Here we have ONE BOX containing a matched pair (2) Groove Tubes replacement output tubes. NOTE – these are a consummable item and as such they CANNOT BE RETURNED. We do not offer any returns whatsoever on these valves under any circumstances. Instead we urge you to visit us and get us to fit these for you. Please only proceed with this purchase if you are happy to waiver your statutory rights. 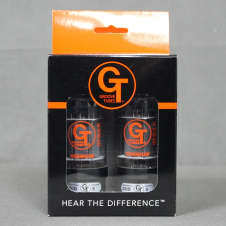 Suitable for many Fender amplifiers. A matched pair of output valves – Medium “6”. PLEASE CHECK YOUR INSTRUCTION MANUAL FIRST. IF IN DOUBT SEEK THE HELP OF A QUALIFIED / EXPERIENCED TECHNIACIAN. Guitar Mania have an in-house amp technician that can offer help and advice. Great dynamics and a very sweet, punchy tone with enhanced power rating and performance. More brilliant top end and a very full, pronounced and round low-frequency output. A solid replacement for stock performance.